On Friday February 15th we’ll be holding a very special dinner in our private dining room. It will be the start of a series of one-off feasts, perfect for parties of between 10 and 14 people, so fantastic if you want to arrange a get together with work colleagues, family or friends. We are very lucky to be able to source exceptional produce and one of our favourite ingredients is the extraordinary delicious 55 day dry aged Middle White pork from Huntsham Court Farm in Herefordshire. The Middle White is a rare breed farmed by Richard Vaughan whose family have been at Huntsham Court Farm for over 400 years. For our special feast we will be taking a nose-to-tail approach serving up dishes including roast pork loin, steamed buns with sticky shoulder, our own black pudding and smoked sausage. 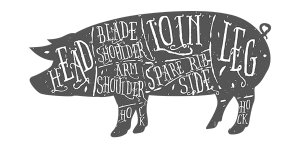 As our chef Mark Kempson says “A special pig deserves a special menu”. The one-night-only five course menu will cost £75 per person, or £120 if accompanied by a matching wine flight. To book call us on 020 7937 0120 or email reservations@kitchenw8.com.